When a site visitor runs a zip code search, the property management companies are ordered by lead price. The company listed first is paying the highest price, the company listed second is paying the second highest price, etc. While we do have a minimum pricing requirement for each property type you accept leads on, above this threshold our pricing is flexible. You may adjust your position up or down based on your desired lead volume and marketing goals. What happens when there is a tie in lead price? If two companies are paying the same price per lead, the company that has spent the most in the previous 7 days is placed higher. How does the listing order impact my lead volume? Typically, visitors start at the top of the list when they do their research. The majority of our leads go to the companies listed in the top 3 or 4 positions for the zip code. 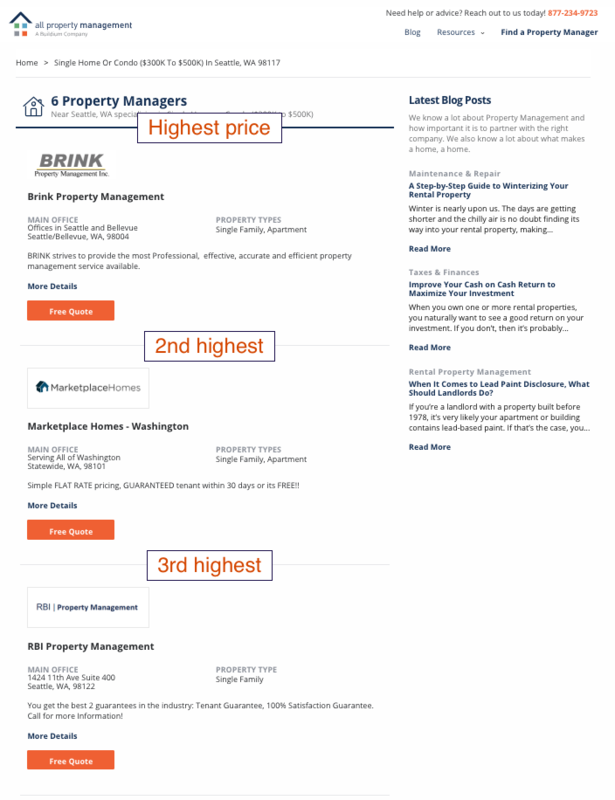 If you are in growth mode, we suggest a lead price to place you in one of the top 3 positions. If you need to reduce your lead volume, a lower position may be more appropriate for you. Often times a small change in your lead price will improve your placement. Any change you make to your price does not have to be permanent. You can adjust your price as often as you like. Is there anything else I can do to increase my lead volume? Yes, the best way to increase your lead volume is to expand your marketing targets. You can do this by adding more zip codes to your profile, or by adding more property types to your profile. Read more here. To see a full list of property types available click here. Why is my position different on different pages? There are two different results pages a visitor sees when they use our site. The Zip Search Results page is described above. The order is determined by lead price. Your position can vary from one zip code to another if there are more or fewer companies advertising there. The Geo page highlights a particular city or state. 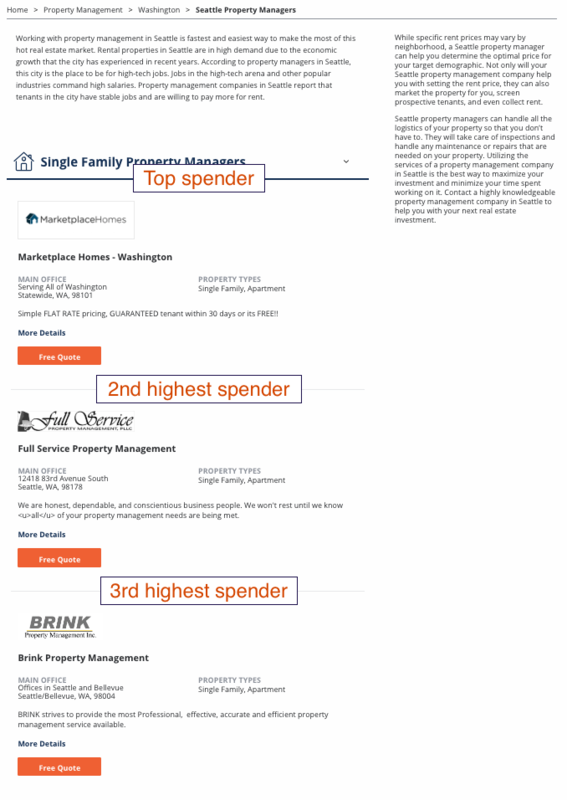 The list on this page is ordered by the amount of money each company has spent on leads, for that property category, in the last seven days. The company that has spent the most appears first, the company that has spent the second most appears second, etc. Some visitors select a company from the Geo page, but generally after a visitor lands on one of our Geo pages, they search by zip code and land on our Zip Search Results page where the listing order is determined by lead price. We do everything we can to encourage a user to do a zip code search using their exact property details since this delivers more accurate search results (which benefits the site user and the property management company). So, while higher placement on the Geo page will result in more exposure and possibly more leads, the majority of our users will find you by doing a zip code search.